Ophthalmic Emergencies: When is a goopy eye more than just a mild irritation? 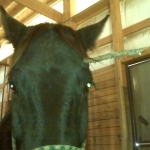 As a prey species, horse evolved to have their eyes located on the side of their head to attain a wider field of vision. While this helps them to better identify potential dangers (mountain lions, bikers, plastic grocery bags, etc) it also predisposes them to injuries specific to their eyes and surrounding structures. If there is ever a question of what is ‘normal’, the opposite side of the horse’s head is usually helpful for a quick comparison! corneal defects. In most cases, if a defect is present, the stain will bind to the deeper layers of the cornea resulting in a green lesion on the eye. (Figure 7) This green dye will eventually dissipate, but it is key in determining the size as well as the regression of the lesion on subsequent follow up visits. (Keep in mind that there is a nasolacrimal duct that drains excess discharge from the eye into the nose. 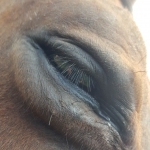 If you see green dye emerge from your horse’s nose after ocular staining has occurred, don’t be alarmed!! This is perfectly normal). 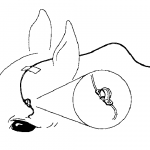 Other diagnostics may include application of a corneal numbing agent called proparacaine to better palpate the globe and surrounding tissues. If a foreign body needs to be removed, additional numbing techniques may be used to better facilitate the procedure. 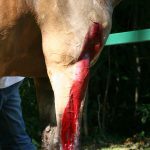 Once your veterinarian has determined the extent of the damage, they will develop a treatment plan geared specifically towards the needs of your horse. 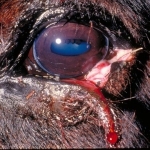 Autogenous serum – processed from the horse’s blood, this helps to slow down continued enzymatic breakdown of the cornea. treatment can be managed by the owner in the field. 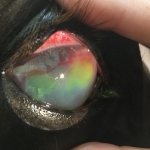 In rare situations, a subpalpebral lavage system may need to be installed for those horses that are highly resistant to direct treatment of the eye (Figure 8). 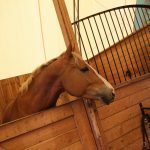 In most cases, immediate attention to the ophthalmic injury significantly improves the long-term prognosis for the horse. In moderate to severe injuries, follow up appointments and assessments by your veterinarian are key to a positive outcome. These repeat visits are used primarily to determine the efficacy of the current treatment plan and the final duration of therapy. 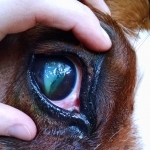 Ophthalmic cases require constant medical attention and diligent follow-up, but a majority of cases have a favorable outcome for you and your horse. 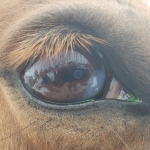 If you think your horse has an ophthalmic emergency, don’t wait a few days to see how he recovers, call your veterinarian now. In severe cases, a few days may be the difference between keeping and losing the eye!